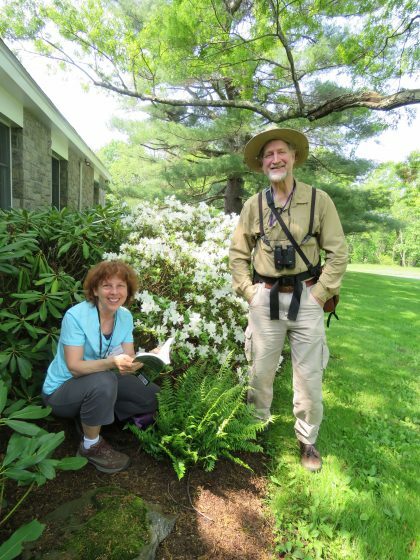 Diane and Jim are Master Naturalist volunteers. No matter what your interests or talents, by volunteering at our Deer Pond Farm, you can help promote understanding, appreciation, and stewardship of our natural world. We have a variety of opportunities available, including office and outdoor help, which are needed to keep the Deer Pond Farm going. This includes serving as co-leaders for programs, citizen science projects, administrative work, trail and garden work, and other tasks both indoor and outdoor. Program Co-leaders: Assist with guided walks by taking attendance and recording data on the bird checklist. Or work with staff on a specific program utilizing your expertise and experience. Citizen Science: We currently monitor Bluebird nesting boxes, Wood Duck nesting boxes and Purple Martin gourds. We also participate in a variety of bird monitoring programs including the Connecticut Bird Atlas, the Summer Bird Count, and the Christmas Bird Count. Administrative Help: Assist with a variety of clerical work including: answering phones, copying, packet assembly, data entry, event support, and publicity support. Garden Team: Join the group or work independently on weeding, watering, planting, invasive plant removal and more. Invasive Plant Removal: Join us on seasonally scheduled work parties to address this major threat to native biodiversity. Learn about the ecology of different invasive plants and management methods. Photography: As you enjoy the trails during a guided walk or on your own, take pictures and share with us to utilize on the website, social media and flyers. Trail Monitoring and Work: Explore the trails and report back to staff your findings. Opportunity to assist with trail maintenance. Joyce is our volunteer Bluebird Nesting Box Chair. We will provide instruction and information, including a training; you just need to bring a willingness to learn and a cheerful smile! Please note, we do welcome service and group volunteer projects, including but not limited to scouts, students and corporations. If you are interested in becoming a volunteer or doing a service project, please contact Deirdra Wallin, program coordinator, at dwallin@ctaudubon.org or 860-799-4074 ext 102. Click here to download our volunteer application. Completed applications can be emailed to dwallin@ctaudubon.org. Our next volunteer training is Monday, January 28, 2019 at 1 p.m. Contact Deirdra Wallin, program coordinator, at dwallin@ctaudubon.org or 860-799-4074 ext 102 to register. Our building is not yet open to the public, but please sign up for one of our guided programs or enjoy the grounds on your own. The Deer Pond Farm Sanctuary is open year-round from dawn to dusk.